Early show. 201 bodies in the bar. Andrew W.K. on stage. Party hard. Everybody’s watching Andrew W.K., my fellow bartender and I have a moment to talk. He says, do you know, in Andrew W.K.’s rider, he asks for bottled water, with the labels torn off? I say, I did not know that. Why would he want that? My fellow bartender says, I dunno. I was trying to figure that out. 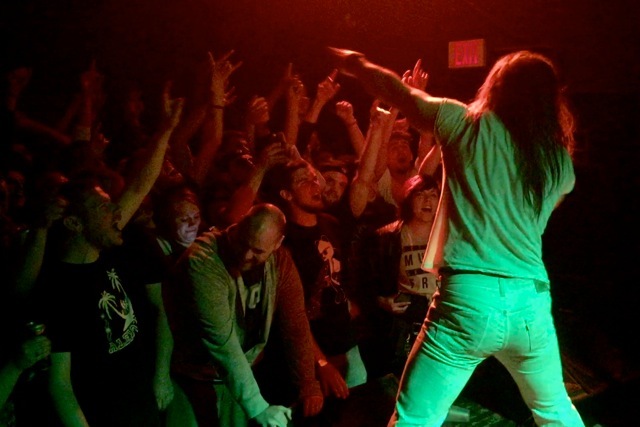 Couple overall impressions I had of Andrew W.K. First off, don’t call him Andrew. Call him Andrew W.K. Secondly, he’s a rock star. i.e., he has a guy soundcheck for him, bring his piano up on stage. He doesn’t come into the club until 10 minutes before he gets up on stage. After the show, while everyone’s waiting to meet him, he slips out the back door. No signing autographs. No pictures. Sayonara, suckers. After the show, place is a disaster. I grab a trash can, start sweeping. It takes me a good 15 minutes to get it all looking back to normal. After I’m done, I make my way to the green room. I open it, nope. No Andrew. But wait, what do I see? A big bag of tortilla chips, and a jar of salsa. Huh. Andrew W.K.’s gone, I better throw them away. No. I don’t throw them away. A buddy of mine comes into the green room, with his new wife. I work with him, he does sound, he bartends, he plays music. He sees me scarfing the chips and salsa, he and his wife join in. I say, you know Andrew W.K. asked for bottled water with the labels torn off? Yeah, he says. I was the one that tore them off, and I got the rest of the things on his rider. Bag of chips, salsa. Four energy drinks. Three energy bars. Three of those energy shots. Seven bottled waters, with the labels ripped off. I say, so you know why he wanted the labels torn off? He says, not for sure. My buddy’s wife says, he goes up on stage, he doesn’t want to give anybody free promotion. Oh look. Andrew W.K. drinks Price Chopper Water. This entry was posted in Bar Story on May 3, 2015 by Clint Curtis.